In research published on 28 February, 2018 in Biology Letters, scientists from Royal Holloway, University of London, Oxford University and Cornell University have shown for the first time that viruses that are harmful to honeybees are also present in hoverfly pollinators. 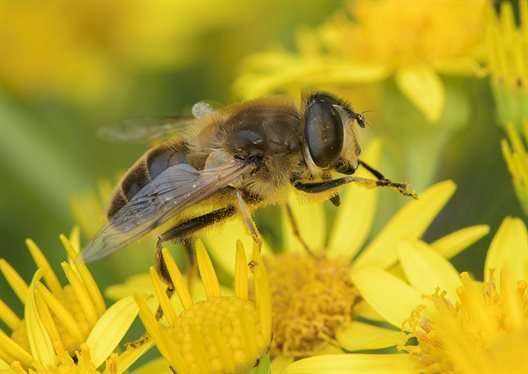 Dr. Emily Bailes, Post Doctoral Research Assistant at Royal Holloway, who led the research, said: "We have seen a decline in bees in the UK for several years, but this study shows for the first time that hoverflies may be moving these diseases much further than bees normally would. "This is because of their annual migrations across Europe. This could expose local bee populations to new strains of the diseases and make them more likely to become infected, much like different flu strains in humans. We therefore need to think of ways to limit this transfer between species. "What we don't know yet is whether the hoverflies are just moving the diseases around, or if they are also causing harm to the hoverflies. This is important to find out because hoverflies are also extremely valuable pollinators, and several species are known to be in decline." Senior author of the paper, Professor Owen Lewis from Oxford University, added: "Most people think of honeybees as the main pollinators of our crops and wildflowers. However, wild insects such as hoverflies are hugely important too. The new results suggest that the fates of these pollinating insects may be tightly linked, if diseases such as viruses can spread between them."